Highest Quality - Our world-class growers guarantee their very best selections! Personalized gift announcement and Flower Lover's Newsletter! Sending a gift in the Flower of the Month Club is as easy as 1,2,3! 1. Just tell us the name and address of your recipient, the details of the club you're sending (like how many months and when to start shipping), and pay online with any major credit card. 2. When placing your order, you'll have the option to send a gift announcement. This is the most important part so pay attention! Our gift clubs ship the last week of every month, but we can send your recipient a gift announcement as early as today including your personal message and all of the details about their gift club (like when to expect their first delivery). 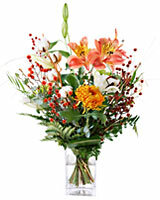 You can send your gift announcement by mail or email or print it on your computer to deliver in person. 3. Step three is the best part. It's where you sit back and relax while someone thanks you for their awesome gift month after month after month. What could be better than that?